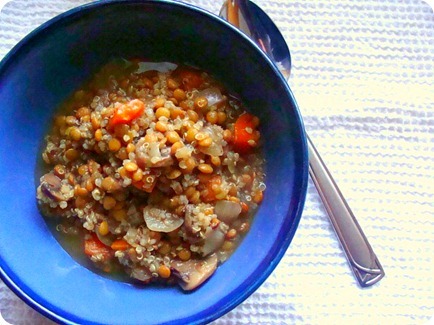 So let’s see here… how many times have I written about lentil soup? I’ve said it before and I will say it again: I love lentil soup. It is my go-to comfort food. 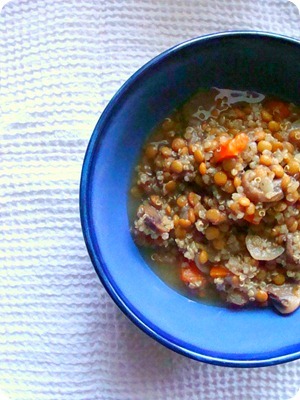 From start to finish, when I am stressed making lentil soup calms me and fills my belly with hearty goodness. I had a long day of traveling yesterday and nothing sounded better than a hot bowl of soup. I peeked into my cupboards, searched through the fridge and had enough ingredients to make a delicious batch of soup. In a soup pot, add oil and turn on the burner to medium. Add onion, mushrooms, garlic, carrots and a nice pinch of salt. Let cook until onions are translucent and soft. Add your liquid, lentils, herbs and turn up the heat to high. Once it has come to a boil, reduce heat to medium low, cover and let cook for an hour. Taste and add more seasonings or salt and pepper. 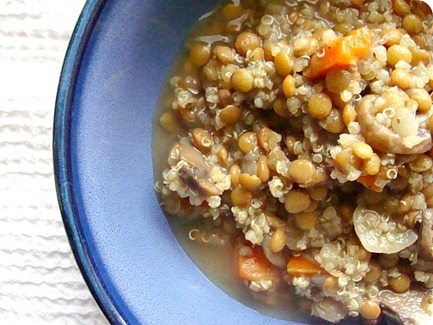 Once the soup is almost done, start toasting your quinoa in a skillet over medium heat. Toasting the quinoa brings the nutty flavor out! Once it is warm and toasted, add to your soup. Cover and let cook for 15-20 more minutes. This entry was posted in lentil, recipe, soup, vegan, vegetarian. Bookmark the permalink.